We continue our tour of primary states with a visit to South Carolina. It is an interesting state, and if Google Analytics is to be believed, we have quite a few readers there (South Carolina has been in the top 15 U.S. states for visitors for a while). It is also a place I personally visited in the recent past. 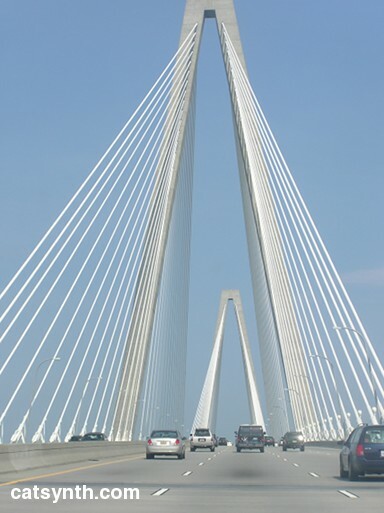 This beautiful bridge opened in 2005, and its clean modern geometry is in stark contrast to the much more traditional architecture of Charleston. I could help but focus on it even when surrounded by the historic buildings of the city’s waterfront and shadows of the Civil War. I think it’s a great addition to the city’s skyline. One of the other things I most remember about Charleston is that it was hot and humid in August, which suited me fine. The heat and humidity was personified by the ubiquitous Spanish moss. Heading north on US 17 past the bridge, the landscape and texture changes dramatically. Small commercial buildings dot the side of the highway sporadically as we enter the Lowcountry. For a while, the highway is close to the coast – it is really 17 rather than US 1 that is coastal highway in the southeastern U.S. – as it winds between forests on one side and coastal islands and marshes on the other. 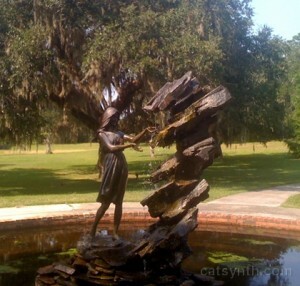 As the highway approaches Myrtle Beach, one can stop at Brookgreen Gardens, which has a large collection of sculptures in a landscaped setting. 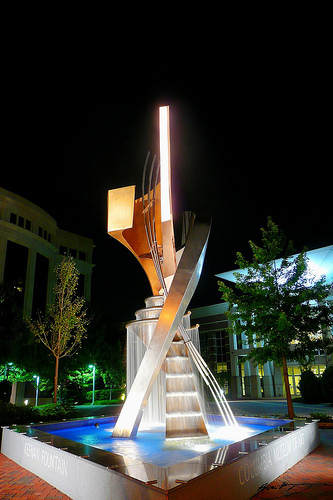 Their focus is on a combination of sculpture by American artists and local flora of the Lowcountry region. Most of the sculptures were figurative, but within this context there were a variety of styles and subjects, including some that combined abstract and modern elements. 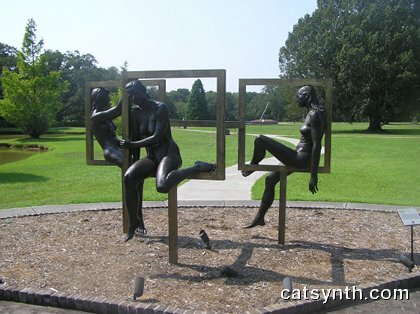 The second sculpture (with the three female figures and the squares) is St. James Triad by Richard McDermott Miller. Unfortunately, I don’t have the information for the first sculpture. In the Monday (January 16) Republican debate, the “I-73” corridor was mentioned, though I cannot recall amidst all the ranting what the context was. But a quick Internet search suggests that the unbuilt I-73 is supposed to begin at U.S. 17 just north of Myrtle Beach and follow SC 22 and then split off and head northwest, crossing I-95 and then into North Carolina. It looks like there is not only a “future I-73” in the Palmetto State, but also a “future I-74”. Who knew? Back in Charleston, one can head west on I-26 towards the interior of the state. We cross I-95, which crosses the state as part of its role as the major north-south highway along the east coast. 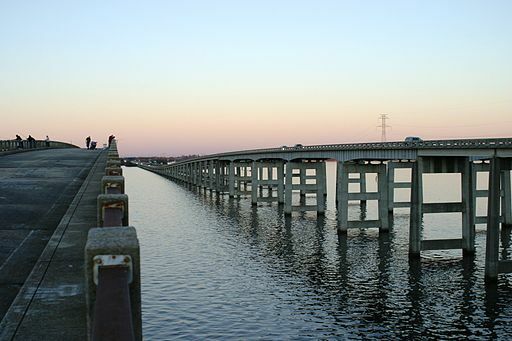 It does cross Lake Marion on a long causeway, where an older bridge next to the highway serves as a pedestrian walkway and fishing pier. Traveling over the causeway in 2009 heading to Charleston, I assumed this was an inlet rather than an inland lake, and did not realize how far away we were from the ocean. Back on I-26, one eventually gets to Columbia, the capital and largest city. A spur, I-126 takes you from the main freeway into downtown. The view above is from Finlay Park overlooking the downtown skyline. It is a relatively recent feature of the city, only about 20 years old. 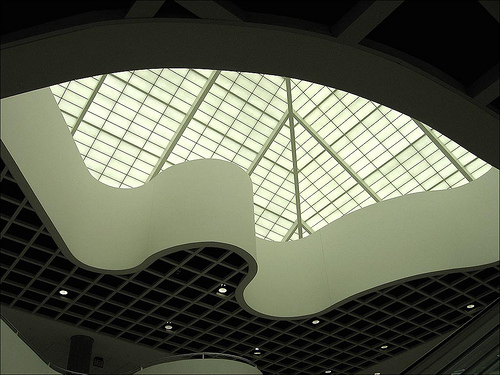 The main library in Columbia also dates back to this time, and features a very modernist design. And only a block away on Main Street, the Columbia Museum of Art, with the sculpture Apollo’s Cascade in its front plaza. These elements stand in stark contrast to the city’s more traditional architecture, starting with the state capital itself; and also to some of the darker moments of its history. Columbia and the surrounding area were devastated at the end of the Civil War. It does not seem like there are many scars left in the city itself (readers, please correct if I am wrong about this), but just outside the city US 76 are the eerie ruins of Millwood Plantation. 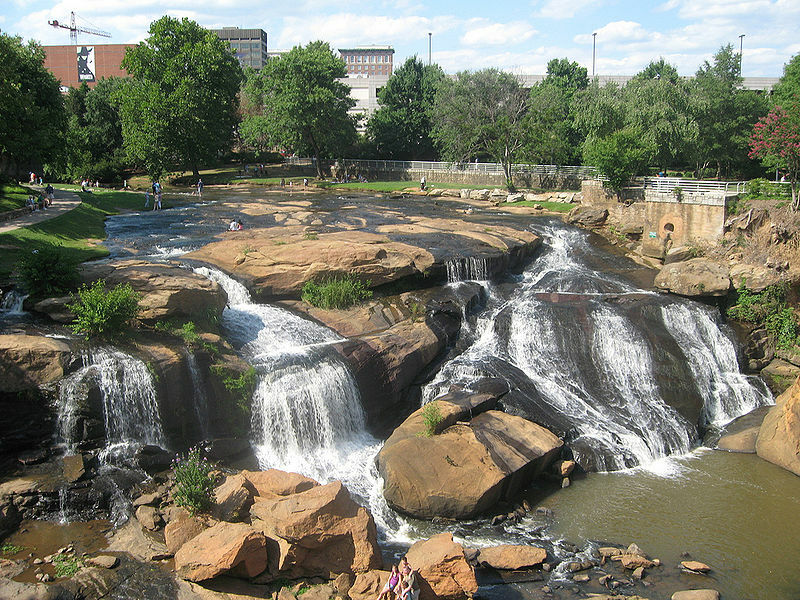 The region around Greenville and Spartanburg has a reputation as being more conservative even in a conservative state. Admittedly subjective, but probably an effect of the proximity to Bob Jones madrassa University. 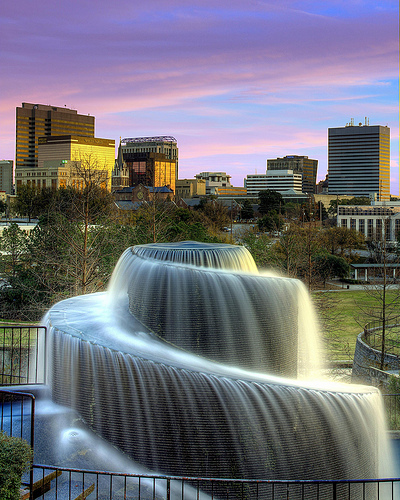 But Greenville itself does have a progressive community that we hear about through a friend and fellow blogger Daisy Deadhead, and even its own Occupy movement, which you can read about. And, finally, I would be remiss if I did not mention Barnwell, South Carolina. It’s a bit out of the way, due south of Columbia and due west of Charleston, but it is the birthplace of one of my musical heroes, James Brown. I am proud to have what I am sure is the only computer-science doctoral dissertation that cites him as a reference.